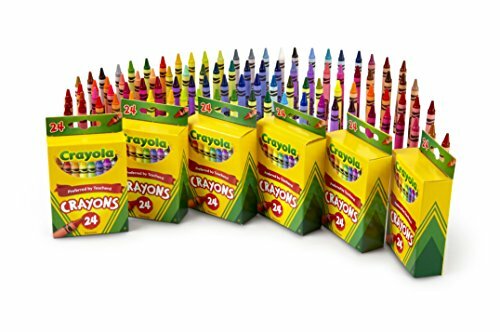 Features 6 packs of 24 count Crayola Crayons, 144 in all. Colors include apricot, black, blue blue green, blue violet, brown, carnation pink, cerulean, bluetiful, gray , green, green yellow, indigo, orange, red, red orange, red violet, scarlet, violet (purple), violet red, white, yellow, yellow green, yellow orange. Durable, long-lasting crayons are double wrapped for extra strength. Each pack provides 24 hues for vibrant, high-quality results and long-lasting color. Safe and nontoxic, ages 6 & up.